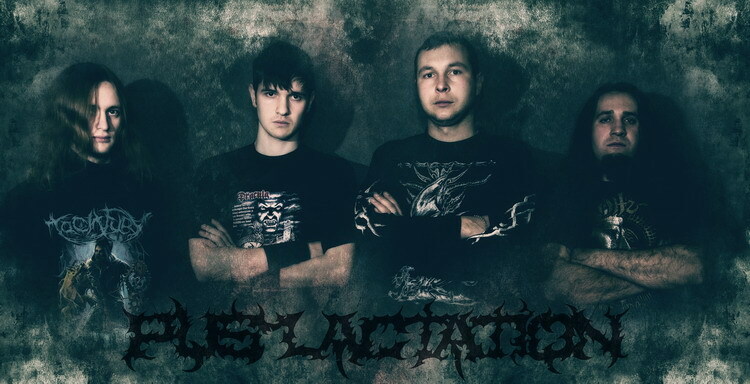 PUS LACTATION (Brutal Death Metal) was formed in 2003 by guitarist Grinder on the ruins of CORPSEGRINDER band. In full assurance of the chosen direction Grinder recruited musicians interested in musical butchery to form a band. The initial lineup consisted of: Max (vocals), Grinder (guitar), Lysiy (guitar), Dodik (bass), Chi (drums). Bassist eventually was dismissed and replaced by Lysiy who switched from guitar to bass. In 2007 the band recorded a sledgehammer 6-track Demo followed by the series of shows in the Ukraine and gained some recognition from death metal fans. At the start of 2009 the band decided to recruit the second guitarist. This position was filled by Evgen, who had already been famed in the city for his soloing. In 2010 Max left the band. He was replaced by Dimos from the local grindcore band EBANATH. Afterwards the band began recording its debut album consisting of both new material and old killer stuff. Unfortunately due to the numerous lineup changes over the last few years the band failed to complete the work on the debut within the scheduled time. In 2013 Fill (vocals) and Rommel (bass) from death metal band HELLCRAFT joined PUS LACTATION. In the end of the same year both bands headed out on the Ukrainian tour. In spring 2014 the debut full-length album �A cage for the brain� was finally finished. In May the band signed a contract with the legendary Russian label More Hate Prod.